WeightWatchers is one of the best known weight loss programs around. The reason it’s successful is that it’s often viewed as one of the easier programs to follow, helping you to change the way you think about and behave around food. Nothing is off limits, so you can still enjoy your favorite meals and snacks, even a drink of alcohol now and then, meaning that you won’t need to make huge life changes, and therefore your chances of success are improved. Many WeightWatchers users will testify that the “nothing is off limits” approach is much more successful than a “just don’t eat x, y or z” weight loss method. The idea behind WeightWatchers is that you become part of a supportive network of slimmers who have been through what you’re experiencing. With this support in place, and a diet which doesn’t completely ruin your day to day life, it’s that much easier to stick to a healthy lifestyle and watch the weight drop off. The system works in three parts, each of which is available to explore on WeightWatchers.com. Firstly, OnlinePlus is a service entirely online. It allows you to chat with dedicated helpers, utilizing useful weight loss tools and calculators. These will help you to monitor where you might be slipping up and when you do well. It provides a great range of tasty recipes which should be fine for a range of dietary requirements. The point is that you can keep eating the foods you enjoy, in moderation. It’s all about balancing those treats with healthier options whenever you can. Secondly, the Meetings section of the website allows you to find meet-up groups in your area. It details what goes on in a meeting, and how that might help you. Essentially, you turn up to a local venue, discuss some new tactics and keep a check on how you’re doing, within the supportive group. Many people make friends this way, and the fact that you have to turn up to the group means you’re less likely to go on a weeklong binge because your friends will be there to see the results. Still, even if things go a bit chocolate-pear shaped, everyone’s in the same boat and is there to help. Thirdly, you can gain access to a personal coach. These people have been in your shoes and know what it’s like to want to lose weight, and how tough it can be. You work closely with them to develop activity plans, calling on them when you need reassurance or a bit of support. They can help you to analyze at your diet and exercise, and to rethink it if you don’t feel it’s going in the right direction. Prices vary depending on the services you’re interested in, but we feel that they all offer very good value for money. The personal coaching is a bit more expensive, but if you want that level of regular support, then it’s still not too pricey. All combined, these three options make for a really supportive system with lots of practical ideas and solutions for improving your weight loss and making sure those pounds stay off. 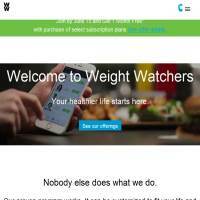 Okay, there aren’t perhaps as many (or as detailed) monitoring and analysis tools as you might find elsewhere, but in terms of support, Weight Watchers is pretty much second to none.